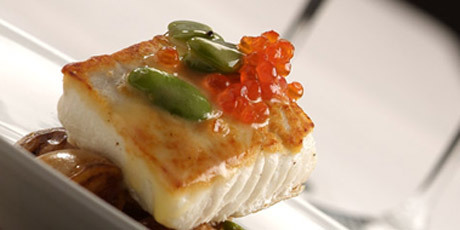 Helmers' organic potatoes, fava bean and chum salmon caviar butter make up this delicious dish. 1. Portion the halibut and season with salt. Let the fish sit at room temperature for 15 minutes to allow the salt to penetrate the flesh. 2. Place the one-ounce of vegetable oil in a heated heavy cast iron pan. Place in the seasoned fish and cook on one side until golden brown. Turn the fish over and place the skillet in a 375-degree oven and cook for about 5 minutes or until the fish is just slightly underdone. 3. Remove the fish from the pan and keep it warm. 1. Wipe the fish pan clean with a dry cloth and return it to the heat. Add the one-ounce of butter and olive oil along with the cooked potatoes and cook until golden brown. Add the shallots, garlic and lemon zest and cook for 30 seconds or until the shallots become translucent. 1. Pour in the white wine and deglaze the pan. Remove the potatoes from the pan and divide between four hot plates. Place the skillet with the shallots and garlic back onto the heat and add the lemon juice and cold butter. When the liquid begins to thicken add the fava beans and heat through. Remove from the heat and adjust the seasoning. 1. Place the warm fish on top of the plated potatoes. Garnish with a spoon of salmon caviar. Pour the hot sauce over the fish and serve warm.